This article identifies a tendency internationally to desensitize the public to the mass-murder by Western-supported governments of whole peoples whom they find inconvenient. Often the victims of this persecution are described as or even call themselves 'communists'. Usually they would more correctly be called nationalist peasant movements against Western supported governments that are privatising and corporatising [colonising] the common and traditional land of these people and depriving them of their right to self-government. Such genocides are later 'economically' justified by an averaged rise in living standards with increased GDP that comes with the overtaking of small subsistence holdings and their adaptation to commercial agriculture and other industries. That these agricultural and industrial changes could only come about by mass dispossession and slaughter of the original land-holders is almost never acknowledged in any manner that might be meaningfully pinned on the political, private and corporate entities which ultimately profit from these despicable colonial events. Australia has a history of cultivating 'wilful blindness' to these events in our neighborhood, under the leadership of powerful government figures. Geoffrey Taylor here draws our attention to an example of such a complex attitude in an interview with Paul Keating last year. 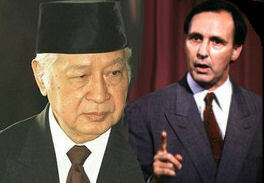 Keating stands out as a prime minister who, along with the United States and the United Kingdom, cultivated Australia's supportive relationship with the brutal and oppressive Suharto Government in Indonesia. Candobetter Ed. Paul Keating (PK): No, no ..
PK: No, he wasn't. No, no! RF: The cars, tobacco ..
RF: I think what you're saying is that, like you have got to watch your terms. This guy down the road -- the gangster down the road isn't such a bad bloke, because he keeps the streets quiet. The demonisation of Communism, which has increased in recent years, allows the large scale killing of Communists in countries such as Vietnam, Korea and Indonesia to be glossed over in the way Keating did or else depicted as other than the gross crimes against humanity that they in fact are. In truth, most Communist Party members in those countries listed above had little in common with Stalin, whose terrible record had been used to so darken the name of Communism. Most would have been much more at home in the Australian Labor Party (ALP) than running Stalin's gulags. The murder of half a million PKI members would have had affected Indonesia in a fashion similar to what the murder of around 20,000-30,000 member of the ALP would have done to Australia at the same time. The destruction of the PKI served to strategically protect the rear of the United States military as they commenced to obliterate Vietnam Laos and Cambodia with more bombs than were dropped in the Second World War, resulting in the loss of more than 3 million dead in Vietnam alone. The scale of the crime against humanity, made possible or directly committed by the Indonesian dictators so applauded by Keating, is chilling - and this man was Prime Minister of Australia from 1991 to 1996! That and other estimates of 300,000 and 1,0000,000 are given on page 25 of Pretext for Mass murder (2006) by John Roosa. As so much of the mass murder was covered up by Suharto's police state, it was not possible to properly investigate the mass murder until after Suharto's resignation in 1998. Thanks. I shall check your reference. "as defence cooperation between the two countries is expanded, the Australian Government will have to act with care to ensure that it is not embarrassed by being linked to possible human rights abuses by the Indonesian military."